While on holiday in exotic Western Australia, a dear friend of mine mentioned that she did not read my regular election coverage because it was on Facebook, and lacked the credibility a blog might afford it. The less insightful may find this an amusing observation, since the reliability of the information is being judged on its presentation rather than its actual merits. However I would suggest this is true of all information, and that it takes a respectable level of self-awareness and critical thinking to recognise ones biases so clearly. Further, there is some level of credibility to be gleaned from publishing in an open forum, exposed to the criticism and debate of strangers – even if all they care to write in their comments are “First Post!” and expletives that I feel add nothing to my vocabulary. One could say that a blog is closer to a peer-reviewed publication than a Facebook note, much as a beetle is closer to the sun than an ant during the day. One could say whatever one wanted, in fact, and that is what one intends to do. At first I shrugged off the idea of a blog as too much effort, which is a bit like a business person rejecting an idea because it will make too much money. I live for too much effort. I am the too much effort king, as anyone who has had the misfortune to friend me on Facebook and then look at the notes page around election time will be aware. While I generally like to believe I keep my finger on the political pulse year in and year out, my main output generally occurs during the elections, specifically Australian elections – because I live in Australia – and American elections – because I fell in love with The West Wing. In between I will probably post the occasional update regarding miscellaneous politics or news stories and – as the name suggests – various infographics on topics that take my fancy. Some of these may be informative ala xkcd.com, and others just general musings and observations without any genuine statistics or empirical justification ala thedoghousediaries.com. All will be abominations of my own creating. I think it should be reasonably obvious why I will not be providing updates on any regular basis. I may go months without a post, and then do one every second day. This is a blog written entirely for my own selfish gratification, and for other people like me who won't visit a site for months and then madly read every new post in a single night. It is also aimed at people who find joy in the most mind-numbing, detailed and possibly (hopefully) obscure topics. A self-righteous post-election “analysis” composed of the phrase “I told you so” a thousand times over. and, hopefully, as much self-awareness and critical thinking as my friend so that I too can acknowledge my own biases. This blog, like my previous election coverage, is not just a restatement of the obvious. It is not even a restatement of the unobvious. Nor is it blind guesswork. 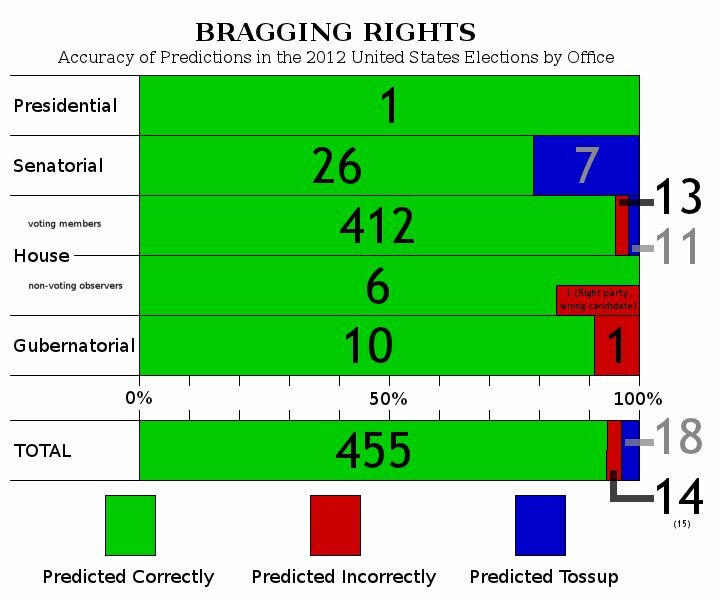 Last November I lodged predictions on the US elections at the Presidential, Senatorial, House and Gubernatorial levels. (I do so love the word gubernatorial.) I not only picked Obama for re-election, I picked Obama way back when every respectable news source was still saying too close to call. That is because I am not a respectable news source. I also correctly called all of the Senate seats up for election (including 2 independents but excluding 7 tossups), 412 of the House's seats (96.9% not counting 10 tossups), all 6 non-voting members of the House on a party basis, 5/6 on a candidate level and 10 of the 11 Gubernatorial seats. My results for the House would have been 416 if I had double-checked what I had written. Those seem like pretty darn good results to me. So hang on for the wild, fun-filled ride that is the Australian electoral season. Ye Haw! P.S. For a professional view of the elections, read Antony Green's blog at blogs.abc.net.au/antonygreen/ . He knows every corner of the electoral system from the constitution onwards and can give just about any election-themed statistic at the drop of a hat – for example that this election has been announced with the most notice of any Australian election since World War Two and possibly since federation. That man is a genius, a dynamo, and my personal psephological hero.